Before Mucho Gusto developed a fan following on the racetrack, the affable chestnut was making friends and surviving Hurricane Irma as a youngster. Mucho Gusto was bred by the accomplished Peruvian equestrian Bernardo Alvarez Calderon and his Teneri Farm. A noted rider on the international show jumping scene, Calderon has also been involved in Thoroughbred racing and breeding for 50 years. His study of bloodlines led to the creatively combined name “Teneri,” in homage to the legendary Italian owner/breeder/trainer Federico Tesio and his all-time greats Nearco and Ribot. Two of Calderon’s homebreds advanced to the Breeders’ Cup by capturing “Win & You’re In” races in Peru – Valiant Emilia competed in the 2014 Distaff (G1) and Birdie Gold in the 2017 Filly & Mare Turf (G1). While Valiant Emilia hails from Calderon’s successful Peruvian breeding program, Birdie Gold reflects his interests in North America as a Kentucky-bred like Mucho Gusto. From the first crop of 2013 Breeders’ Cup Classic (G1) star Mucho Macho Man, who aims to uphold his precarious sire line, Mucho Gusto is out of a mare by the “Iron Horse” Giant’s Causeway. His dam’s name, Itsagiantcauseway, never lets you forget that. She was bred by Zayat Stables, later famous for 2015 Triple Crown champion American Pharoah, but sold before beginning her racing career. Although a winner of only three minor races on turf, Itsagiantcauseway had broodmare potential as the descendant of a prolific Pin Oak Stud family, related to Canadian Horse of the Year Peaks and Valleys and Grade 2 hero Alternation. Yet that potential appeared very speculative when Itsagiantcauseway toured the Keeneland November sales ring in 2015, carrying her Mucho Macho Man baby. Attracting a top bid of only $17,000, less than her reserve price, she was led out unsold and returned to Shawhan Place, the Paris, Kentucky, nursery that Calderon’s mares in the Bluegrass call home. 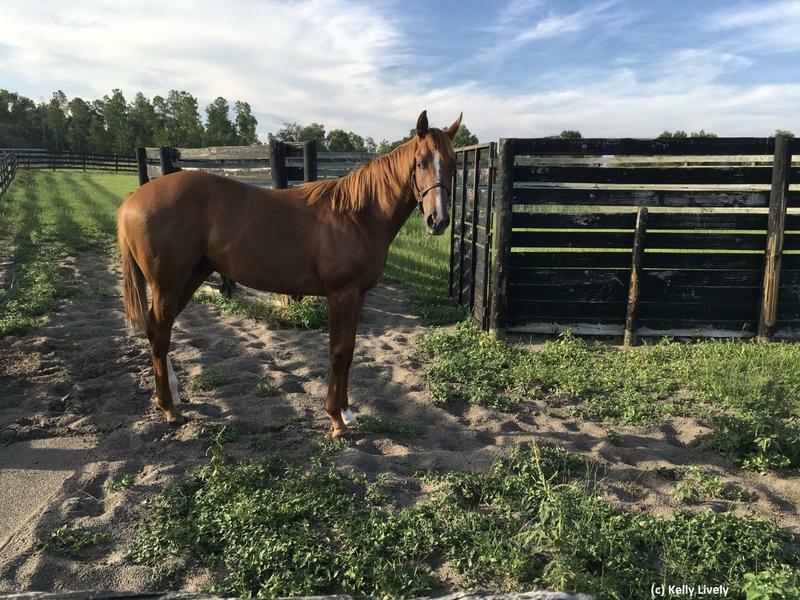 Her chestnut colt arrived on April 26, 2016, and soon went about winning friends, as Courtney Schneider, Shawhan’s director of sales, recalled. “As a young horse at Shawhan Place, Mucho Gusto was liked by everyone. Apart from his good looks, he was incredibly friendly and always in your pocket so to speak,” Schneider said. “He was a cool horse because he did everything easily as a foal. He was very inquisitive. He liked to watch everything, you could almost see the wheels turning in his head. “He was also independent and didn’t stick to his mother’s side 24/7 like a lot of foals do. He very quickly learned he could explore the field out away from his mother and in doing so he made friends with the other foals in the pasture quickly. Right after he officially turned a year old, the yet-unnamed colt was offered at the 2017 Keeneland January Sale. 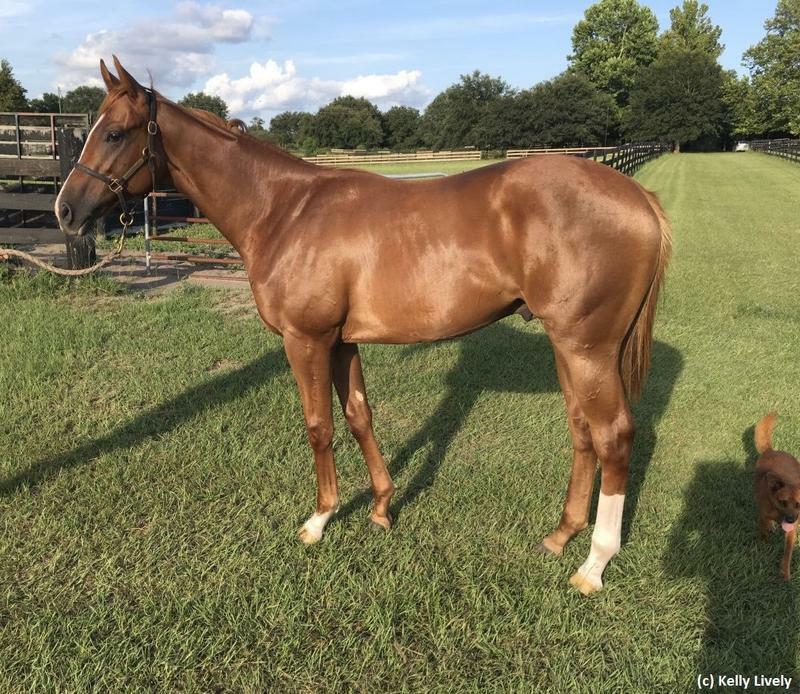 Ocala-based Kelly Lively, who coincidentally had just discussed with friends the possibility of getting back into buying a horse, spotted a bargain. “I loved his dad as a racehorse. I was also interested in buying a first-year sire,” Lively said, with the proviso that stallion’s progeny wasn’t too expensive. The chestnut from Shawhan Place’s consignment filled the bill, and Lively believes that the timing helped her purchase him for $14,000. “He was one of the last horses in the ring on a really cold day. A lot of it was just luck. The Mucho Macho Man-Itsagiantcauseway colt took up residence at the Lively farm in Ocala, where he buddied up with a paddock mate. Once that friend moved on, he remained eager for companionship, and loved life running around the field and playing “chase” with Lively’s 15-pound dog, Goldie. Even amid the play, he showed the right signs of a youngster with a future, demonstrating a good mind and tractable nature. He especially took to all the hand-walking. There was just one hiccup before he revisited Keeneland for the September Yearling Sale – Hurricane Irma. Lively had to leave early to work the sale, but since the colt wasn’t due to sell until later, he stayed behind in Ocala with Lively’s husband, David. Sheltered in his stall overnight, the colt came through everything fine. But the ordeal was just beginning. Once the barn was under water, David had to move him to the round pen. Then came the mishap that David had to report to Kelly in Kentucky: somehow in the round pen, the colt sliced his shoulder. That could have spelled disaster on the eve of the auction. Thankfully it was just a superficial wound. Still, he needed 15 staples to patch him up, hardly an ideal way to make the trek to the sales pavilion. Lively has a working relationship with Carrie Brogden and partners’ Select Sales Agency, which accordingly consigned the colt to Keeneland September. One of the Select Sales partners, Andrew Cary, remembered him favorably. “My personal recollections are that I really liked him every time we saw him at Kelly’s farm in Ocala during the spring of his yearling year,” Cary said. “He had very racy, athletic angles and was a great mover who was light on his feet. At the sale he handled everything very easily and was well received despite being a little light in female family pedigree,” at least up front on the page with the top relatives at a further remove. The colt proved more attractive than he had eight months earlier, selling to S.R. Schwartz, agent, for $95,000. He would furnish an even bigger return on investment at two. Learning his early lessons at Kip Elser’s Kirkwood Stables in Camden, South Carolina, the juvenile was ready to strut his stuff at the OBS March Sale. One might have expected him to turn heads after he sped a furlong in :10 at the under tack show, but the spare, leggy youngster didn’t stand out to the tough buying crowd. Bidding maxed out at $55,000, not enough to part with him, and he pointed toward another sale. His time came at the Fasig-Tipton Midlantic Sale in Maryland last May. Rains had turned the Timonium track sloppy, and he relished the going. By splashing a quarter-mile in a bullet :21 1/5, he advertised himself as a top prospect worth a hefty price tag. Michael Lund Petersen had to go to $625,000 to secure the colt, whom he named Mucho Gusto. Since Petersen has campaigned several major runners trained by Bob Baffert, it was no surprise that Mucho Gusto went to the Hall of Famer’s barn. So did Petersen’s even pricier Midlantic buy, the $925,000 Tale of the Union. Just a couple of weeks after the sale, Mucho Gusto was already on the Los Alamitos worktab for Baffert. But before he started, stablemate Tale of the Union already made headlines as a smashing Del Mar debut winner and instant Kentucky Derby (G1) hopeful. As the twists and turns of the Derby trail would have it, though, Tale of the Union has not raced since, and Mucho Gusto stepped up. A four-length winner first time out at Los Alamitos last September, Mucho Gusto turned in a gritty performance to capture the Bob Hope (G3) at Del Mar, and held second behind stablemate Improbable in the Los Alamitos Futurity (G1). The speedy colt showed that he could adopt stalk-and-pounce tactics to rebound in the Robert B. Lewis (G3). Reverting to his front-running style in the Sunland Park Derby (G3) didn’t work, as he was softened up by a pace battle and tired to third, but the hard-trying colt may get another deserved chance in the Lexington (G3). As Mucho Gusto comes full circle to Keeneland, his friends at Shawhan Place are rightly proud of him, and thrilled for the recognition that Calderon is receiving as the breeder of a classic contender. “Mr. Calderon has been a longtime, loyal client of Shawhan Place,” Schneider said. “He was one of our very first clients when Shawhan Place was started back in 2006. Without the support of the Calderon family Shawhan Place wouldn’t be what it is today. “The Calderon family is everything that is good and right in our industry. They give their mares every chance in the world to be successful, and we are ecstatic they were able to breed such a nice horse in Mucho Gusto.